As skydivers, we tend to like to do things together. We like to skydive with our friends, give each other grief about any minor mistakes during the dive, celebrate our successes, and enjoy brews together after sunset. Some people prefer solo skydives on occasion so they can work on skills or just enjoy the sky without distractions. Keeps the entire load in an airspace box from which any reasonable skydiver should be able to land on the airport. The risk of leaving too little time is collisions between groups, whether these are freefall or deployment collisions. But leaving too much time can spread out the jump run so much that the last skydivers out may not be able to make it back to the landing area. So how do we decide how much time to leave? Luckily, skydivers before us have developed guidelines to tell us how much time is safe between groups based on experience. Keep in mind, however, that two major factors play into the answer. Group size. The larger the group, the higher they will break off and the more overall horizontal space the group will occupy when breaking off and deploying. Thus, you must leave more time when following out a bigger group compared to following out a solo skydiver. Ground speed of jump run. The space we want between groups for each group to have a clear column of air in which to deploy their parachutes is horizontal space, not vertical. (Vertical isn’t good enough because what if someone in the lower group has a premature deployment? Or what if someone in the upper group cuts away?) If the plane is flying slower into a headwind, it’s covering less ground per second, so we need to leave more time between groups to get the amount of horizontal distance we want. Below is a graph showing how much time you should leave between groups of varying sizes. Remember: Exit separation is time between EXITS, not between the previous group’s exit and the start of your climbout. This graph is posted on our Safety Stand in the hangar so you can check it anytime you have a question about how much time to leave between groups. It is great that your dropzone is addressing what can be a serious and often overlooked safety issue. Your article is informative and concise. I feel it would be beneficial for the article to include how much separation is wanted between groups in feet (SIM says 1500 for smaller groups and 2000 for large groups. I also feel that it is important that we use the most accurate means to determine the aircrafts ground speed. The old method of using the aircrafts average airspeed and subtracting the forecasted winds at jump altitude is not the best method. We all know that the forecasted winds can be incorrect and if the pilot is not flying directly into the headwind the forecast is nullified. Another popular method which is better but not great is to use the ground speed from the first load to inform jumpers for the rest of the day. The reason this is not a great idea is that the winds change, the pilot may change jump run from one load to the next, or the actual pilot may be changed, if the replacement pilot gives a different cut the ground speed will change. Now that virtually all skydiving aircraft have onboard GPS. 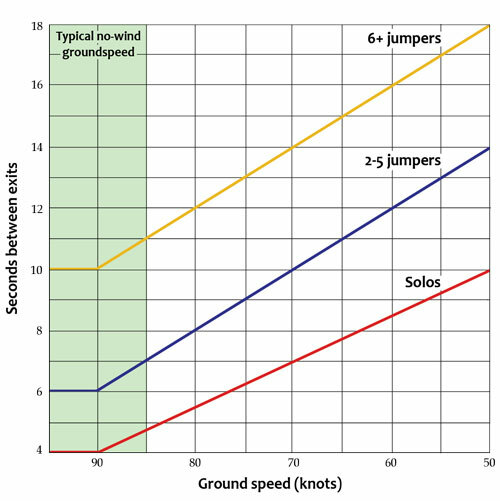 Separation time should be determined and communicated to the jumpers on jump run after the cut.This is the only accurate way to determine ground speed of a given load. Then if your chart is prominent in your aircraft the jumpers can have a real way of determining the correct amount of time to leave. a few seconds off can have serious consequences. For those interested my article on DropZone.com goes into greater detail. Hey JC, thank you for your input and for sharing this article! I encourage everyone to read it and think about the scenarios and factors affecting safe separation. Next PostNext Whose Airspace Is It, Anyway?